As the word implies they are ‘under’ pants or trousers or breeches, according to which era you are looking at. 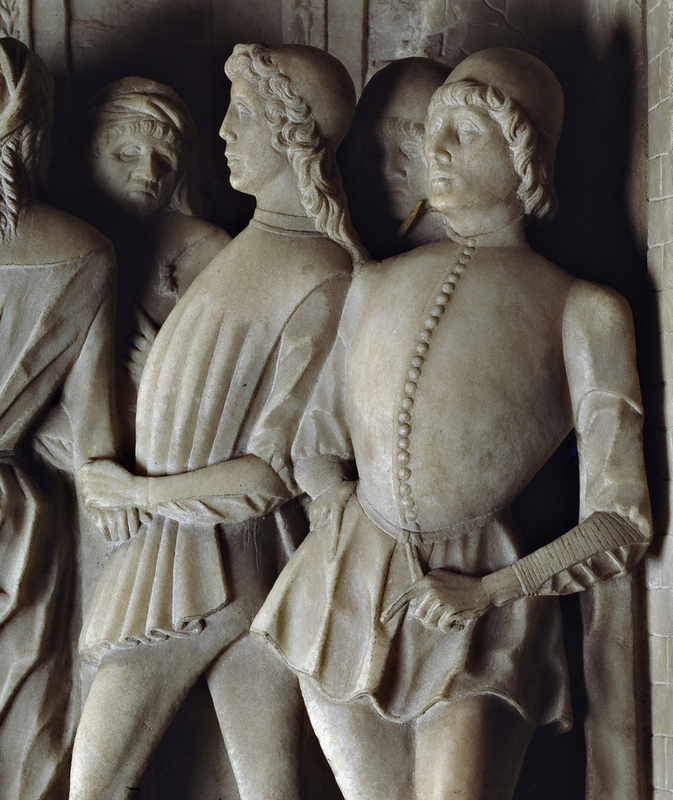 Investigating the history of Renaissance men’s underpants is complex. Primary sources are scarce: practically no surviving underpants, some documentary sources and limited visual material. 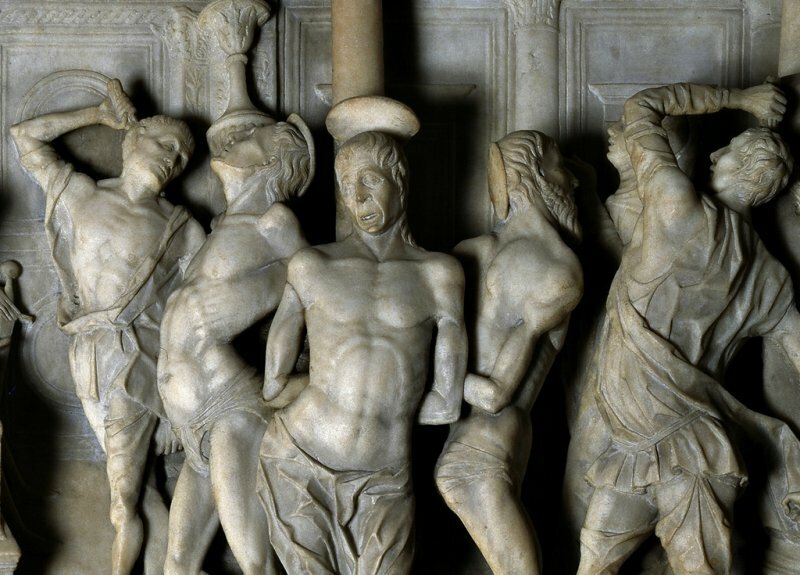 In Christian medieval Europe, representing naked – or nearly naked – men was frowned upon. Things got better with the Renaissance and the revival of classical ideals of beauty. 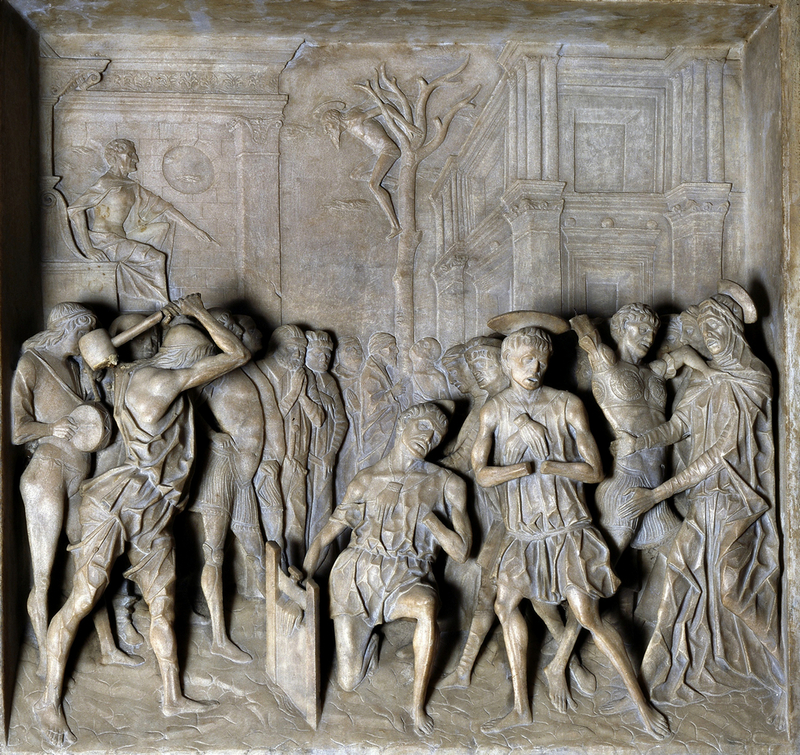 Portraying nakedness in the name of art was not only acceptable, but became fashionable among Italian Renaissance artists especially. As most art commissions were still religious, artists had to find the appropriate themes where they could include naked bodies (which by the end of the 1400s they were studying assiduously and reaching exhilarating results. See Michelangelo Buonarroti). 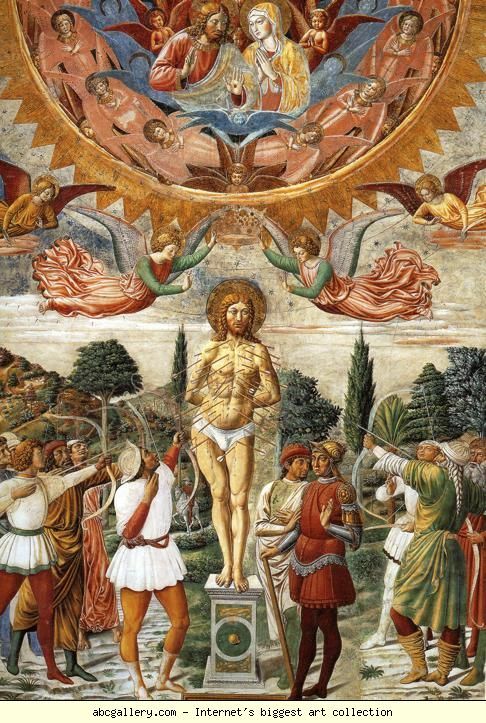 ‘Christ on the cross’ was popular , but in terms of dress, not useful to us as the figure of Christ followed an iconographic convention which showed him naked with a cloth draped across his loins. Fortunately, Renaissance artists liked to place religious themes and stories within a contemporary context. 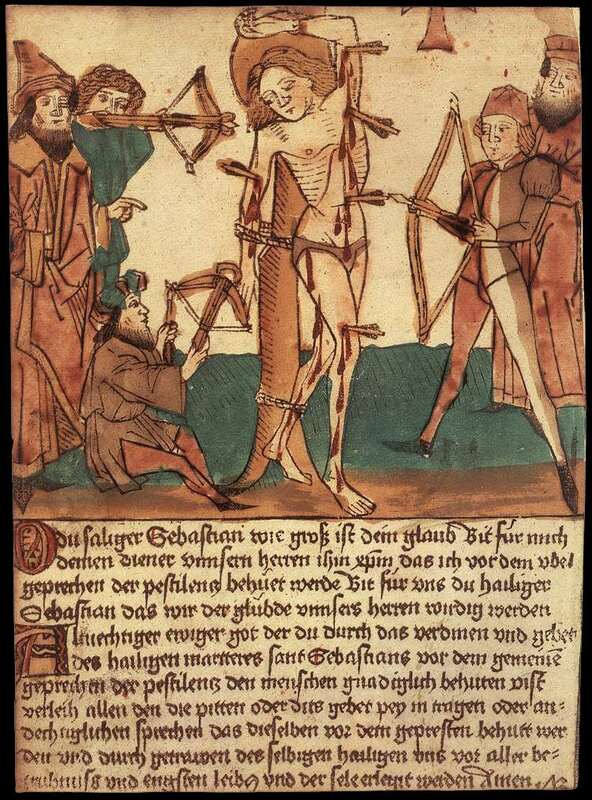 Thus we have representations of saints being flogged, stoned, burned and, as in the case of Saint Sebastian, shot with arrows at close range. Usually these saints are represented as normal citizens, stripped down to their underwear. For a dress historian this is as close to a real pair of Renaissance men’s underpants as one gets. A survey of images of semi naked saints produced between the 1400s and the 1500s brought some interesting results: two types of underpants seem to have been in use and were being represented at this time. We could say, in general terms, that the style worn was related to fashion and hence to social class. 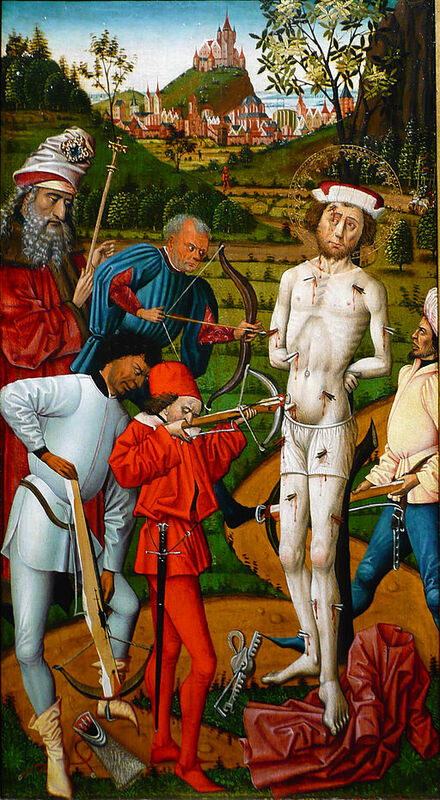 According to the perceived social class of the saint (these saints were ‘transposed’ into the contemporary with great artistic licence), they were shown wearing either baggy pants or close-fitting briefs. 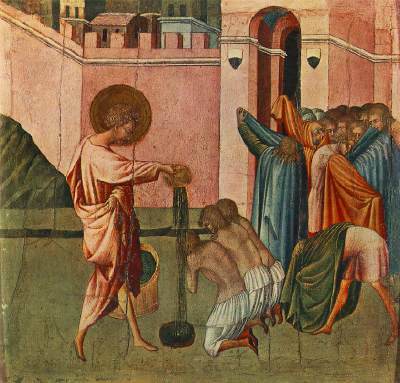 In the above scene the three men being baptized have stripped down (others are in the process of doing so), they wear the long-legged, gathered, linen under trousers which had been in use since barbarian times. 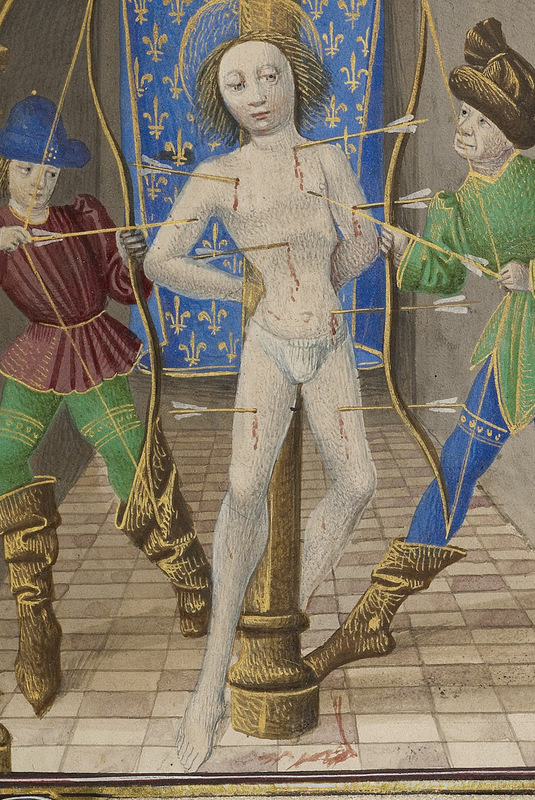 Saint Sebastian was usually represented as an upper class man. In this image we see that he has retained some of the dignity of his status through his fur-lined hat, still on his head. His underpants are a kind of modern-day ‘boxer short’ gathered at the waist line and reaching down to the top of his thighs. The textile used is a fine soft linen, we can imagine these shorts would not have been too bothersome under his long gown, visible on the ground under his left foot. 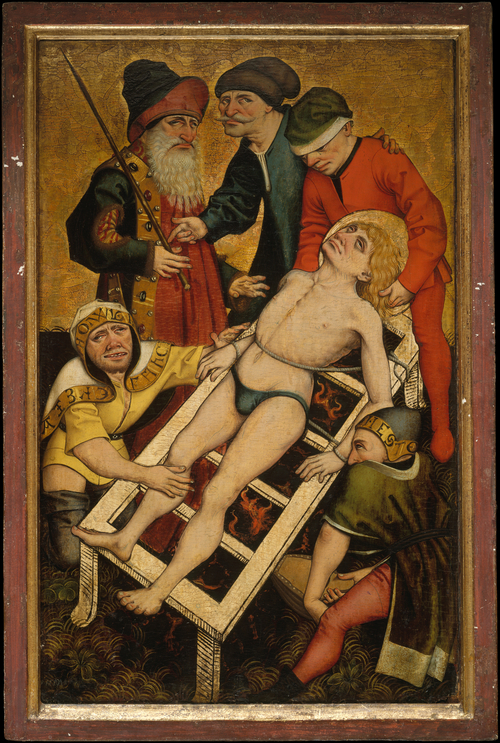 Of the three saints being flogged in the above image, two wear real underpants in the ‘brief’ style. 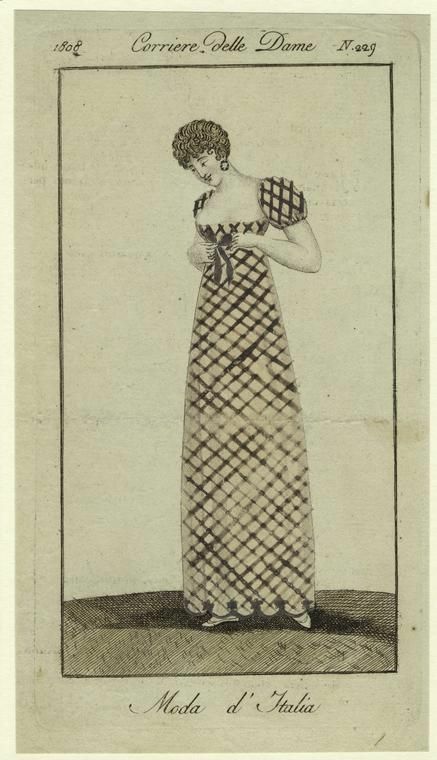 These would have been made out of linen and cut on the bias to assure a minimum of stretch, yet reduce the bulkiness of the fabric. Perfect under the tight-fitting hose. In the above image the artist is careful to represent the construction of the underpants: there is a central section gathered at the waist to create a sort of ‘pouch’, while the rest is smooth and probably cut on the bias. The only surviving pair of briefs I have found from this period is Austrian and it is believed to have belonged to a woman as it was found alongside a bra-like garment. After seeing so many ‘briefs’ worn by men during this period maybe we should not take it for granted that these were a specifically female garment. Maybe there is an interesting story behind these pants too. 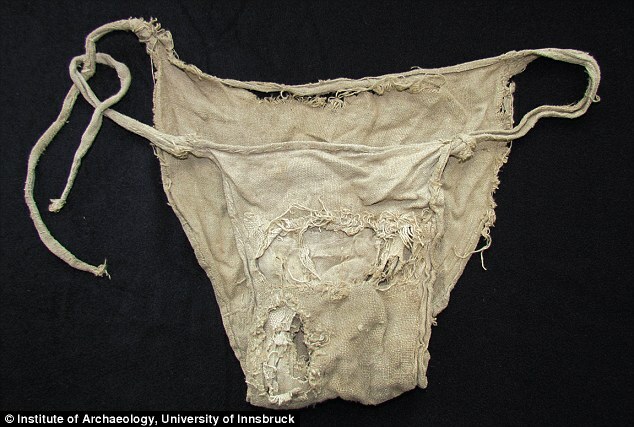 Linen underpants, found at Lengberg castle, Austria. 15th Century.